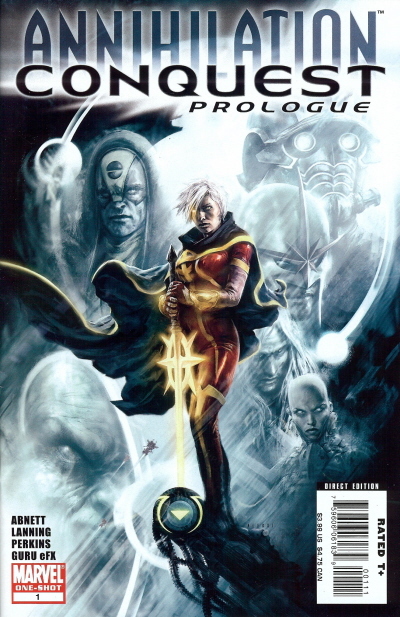 Annihilation: Conquest Prologue No. 1 - August, 2007. Published monthly by MARVEL PUBLISHING, INC. a subsidiary of MARVEL ENTERTAINMENT, INC. OFFICE OF PUBLICATION: 417 5th Avenue, New York, NY 10016. © 2007 Marvel Characters, Inc. All rights reserved. All characters featured in this issue and the distinctive names and likenesses therof, and all related indicia are trademarks of Marvel Characters, Inc. No similarity between any of the names, characters, persons, and/or institutions in this magazine with those of any living or dead persons or institutions is intended, and any such similarity which may exist is purely conicidental.